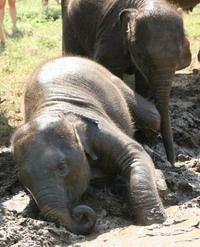 Education about Asian elephants and conservation issues, is one of EleAid‘s main objectives. Elephants are fascinating animals in so many aspects; their biology, their complex social behaviour and their relationship with humans. Due to their numerous charismatic features, elephants particularly appeal to children and are therefore an excellent gateway, to encourage young people (and older ones too) to take an interest in animals, conservation issues and to have a general appreciation of environmental concerns. Children and young people, more than any other group, care passionately about the environment and the future of their planet. EleAid worked closely with schools and youth groups to educate children and empower them to make a difference to the elephant issue. We worked with all ages, from five years old Rainbows, to gap year students, wanting to gain hands-on elephant experience. We have assisted countless children across the world with individual projects about elephants and the environment.